A Georgia O’Keeffe biographer, storywriter, and third-novelist (This is My Daughter, 1998, etc.) pursues in lusterless fashion a conflicted widow who marries the wrong brother. 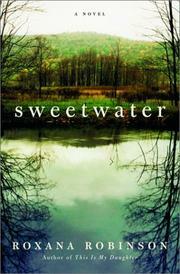 Water is the dominant metaphor in this emotionally bloodless work: late-40s protagonist Isabel Green is an expert in effluent contamination at NYC’s Environmental Protection Resources, and her brand-new self-important second husband, Paul Simmons, has brought her for the first time to visit his family’s lakefront summer home, Sweetwater, in the Adirondacks. Isabel is still recovering from the depression-induced suicide of her first husband and has married Paul out of sympathetic pity and hope for comfort in old age—a decision soon revealed as cruel and shortsighted. Paul and his aged, unloving parents are severely stiffened WASPs with crosses to bear: Paul’s own lifetime grudge concerns a jealous rivalry with his younger brother, Whitney, a never-married Wyoming conservation-biologist whom Paul suspects of stealing his girlfriends. In fact, Whit does attract Isabel, with his stories of observing and protecting western lions, and her staggering betrayal coincides with the approach of a forest fire as the Simmons family tongue-barb each other mercilessly about their shortcomings. The story is a strange amalgamation: a treatise on environmental stewardship; an elegiac memoir about the desertion experienced after the suicide of a spouse; and an awkward growing-to-maturity feminine manifesto. Although Isabel is reading Proust (mentioned offhandedly), her utter lack of self-knowledge is preposterous after Robinson’s meticulous chronicling of her early courtship with and marriage to Michael; motherhood and later attempts to conceive a second child; career development and fear and denial of Michael’s growing depression—as preposterous as Isabel’s marriage to a man merely to be nice. Robinson takes no risks as a writer (“Isabel’s imagination was water, and the more she learned about it, the more marvelous it seemed”), and as a result her writing seems as constipated as her characters. A chilly, desolate work, as painful to read as diving into a frigid lake.